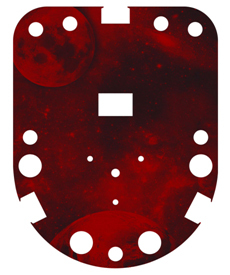 Meade compatible tray for Superwedge/Ultrawedge/X-wedge with dramatic astro graphic reversible tray design. The image side of the tray is a UV protected adhesive applied to the tray. It is weather resistant. Works in both Altazimuth and Equatorial modes. This tray holds the scope controller, 7 1.25" eyepieces and 4 2" eyepieces.